Clementine Zeender gets ready for her close up. Built on Stilts opens on Thursday, August 9 at Union Chapel. This is the time of year when curious things are observed in and around Union Chapel, the 1870 octagon in downtown Oak Bluffs. You might hear music playing and catch sight of 19 little kids prancing around the chapel like Flying Horses, while on the lawn outside a slender young man in a backward baseball cap moves his limbs fluidly through a series of precise steps. The beat of drums also becomes part of the neighborhood soundscape. Curious passersby cluster at the doors of the wooden sanctuary. Some are drawn in and take a seat; others watch for a while and stroll on. 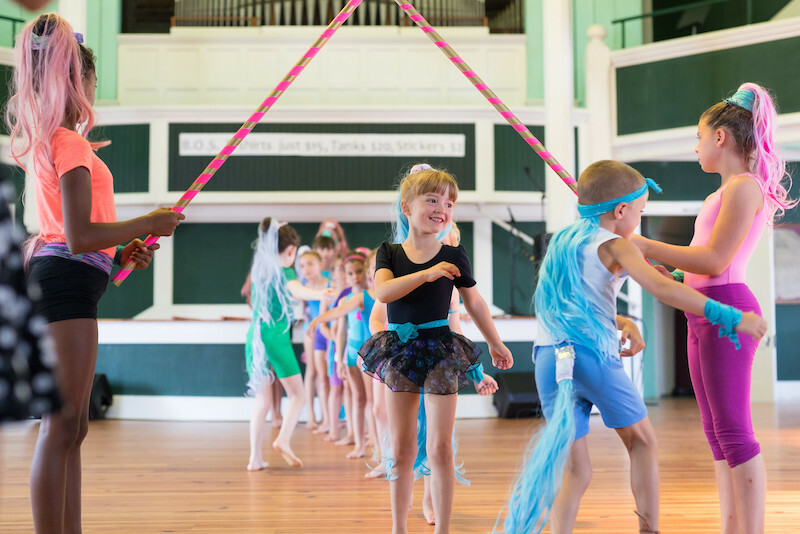 This can only be Built on Stilts, the all-ages dance festival that for 22 years has brought performers and audiences together in a free, wide-ranging celebration of movement, music and narrative. From August 9 through August 11 and again from August 18 through August 21, Built On Stilts will present about 50 different acts including modern dance, tap, spoken word, music, bellydance and a Zumba troupe. There will also be stilts, but they came as an afterthought, said festival director Abby Bender. The event is named for some dormitories built precariously over a ravine at Bard College, which Ms. Bender attended along with festival co-founder Anna Luckey. As many as five high-stepping stilters could appear outside the chapel, but don’t expect any fancy moves, Ms. Bender cautioned. “We just stilt around. We’re not dancers,” she said. Inside the wooden octagon is where the real dancing takes place. Scores of performers, from five-year-olds to senior citizens close to 80, take the floor in a series of evenings that always begin with a drum circle. 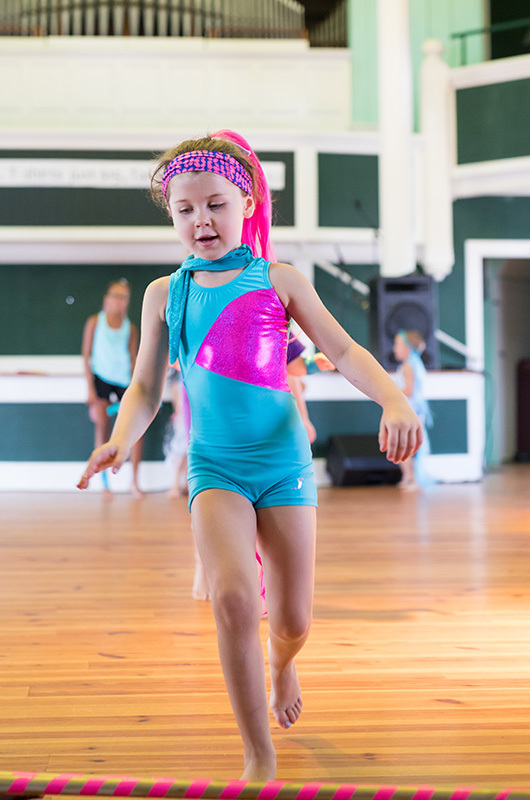 “Every year it’s kind of the same and it’s totally different,” Ms. Bender said Tuesday, during a rehearsal break between the children’s carousel dance and a piece featuring half a dozen older girls performing to music by Petit Biscuit and D. Numbers. 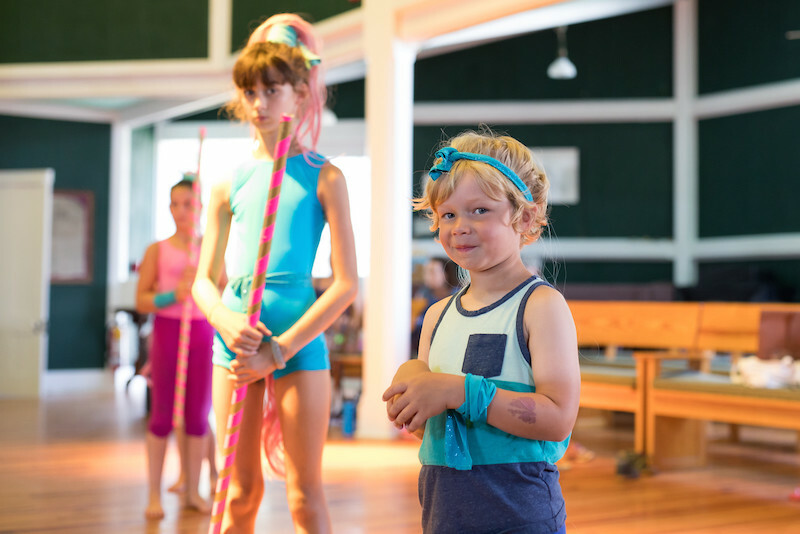 The youngsters are in the festival’s Stiltshop (ages 5-10) and Advancedshop (10-13) classes, which met for seven two-hour sessions to develop their dances for this year’s shows. “With the little ones, we spend a lot of time playing,” Ms. Bender said, while the Advancedshop class works more on building the dance. “Kids that age, their hardest thing is structure, using space, but they love to come up with moves,” she said. While many of the girls in the advanced group have come up through the annual Stiltshop program, others have danced elsewhere and some don’t dance at all except for Built on Stilts, Ms. Bender added. “I love the variety,” she said. In addition to directing the Advancedshop and one of the Stiltshop groups, Ms. Bender herself will perform several times during the festival. “My stuff is sort of a comedy-dance-theatre hybrid,” she said. Ms. Bender is also appearing with Laura Sargent Hall and in a drag duet with Andy Jacobs. “It’s my first appearance as a proper drag king, which I’ve never done before,” Ms. Bender said. Koko Capece and Declan Welch. Ms. Bender estimates about 60 per cent of the programming this year is in the genre of modern dance. The rest varies widely, with acts including Vineyard Bellydance and Revue and Karam Bellydance, the Wondertwins and an Island tap dance group called Dames on Steel. “I saw them do it at Pathways and thought, why aren’t they in Built on Stilts?” recalled Ms. Bender, who invited them on the spot. Musicians appearing at the festival include Sophie Hiller (who’s also the tap dancers’ teacher), Ben Taylor, Roberta Kirn and Julia Gaines. Award-winning slam poet Christopher Johnson of Providence appears during the first weekend. Each night of the Built on Stilts, the Union Chapel doors open at 7:30 p.m. as dancers warm up during the drum circle and Ms. Bender leads her stilt crew on the grounds outside. Admission is free and audience members may come and go as they please throughout the evening. For more information and the nightly program, visit builtonstilts.org.